I recently got the base game. After searching the forums, one issue I haven't seen addressed regards when a card gives you a Deal for 1 Food. There are a fair number of cards that offer this Deal. Given that you have to pay 1 Food to get the Deal, and that it is (for the most part) a one-time benefit, why exchange 1 Food for 1 Food? There are a handful of cards that allow you to either reactivate or otherwise benefit from previous Deals, but not many. Certainly fewer than there are Food Deal cards. Is there any other good reason to make this 1-for-1 Deal? Re: Deals: Food for Food? The Deal adds to your production each following round, as well. Adds to Production! Wow, how did I miss that? Thanks! *I think I misread "each signed Deal provides the player with 1 specific Good" as pertaining to the one time you make the Deal. "Deals provide various benefits to the player immediately after performing the action and during the Production phase of each following round." Yeah, I was gonna pipe in and say not to forget that you get the goods as soon as you make the deal. Much like when you build a production location, you get the goods it produces immediately also. Problem is, that was the only part I was doing. Heh, yeah - doesn't sound like a very good deal your way! Imperial Settlers is a fun game, but the rule book leaves a lot to be desired. I think we played 3 or 4 times before we realized that when you build a production building, you immediately get whatever it produces, plus any building bonuses. The early couple of turns seemed really hard that way. So don't feel bad about missing a rule. Imperial Settlers is a fun game, but the rule book leaves a lot to be desired. It seems this happen far too often with games that are really worth playing. 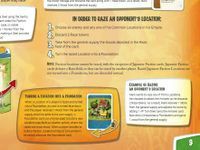 One example present in Imperial Settlers' rulebook is when a necessary action or effect is not clearly included in the sequence of steps. When players are checking during a game to see that they're following all the steps, all of the steps should be plainly listed. For example, the RAZE Action includes two sets of 4 steps, very well outlined. However, the steps required "IN ORDER TO RAZE AN OPPONENT’S LOCATION," end with step 4. "Turn the razed Location into a Foundation." Players need to know that there are still two steps left, which could be considered 4a and 4b. But, instead of following in the same format and structure, those steps are set aside in a block of smaller text in a bubble that does not scream "I'm vital to this Action!" or "Do this every time!" 4a. Turn the razed Location card face down. 4b. That opponent receives 1 Wood from the general supply. Note: A Foundation card can only be used to build a new Location (see Build a Location action) where the razed one once stood. When a player decides to build a Faction Location on top of a Foundation, he simply discards the Foundation card. To be fair, it’s right there under ‘Build Location’. Its really a final step, which is to turn the location into a foundation, which is the procedure highlighted in the box. Not having a go, just that to me the box shows something is important, not ignorable. The box is also referenced precisely as the instruction is. I suppose how instructions are read can be subjective. But personally I thought the Imperial Settlers rulebook is one of the better ones I’ve seen and we got going pretty quickly after a thorough read with no mistakes. Some of the cards are a touch confusing at times but the core rules were crystal. It is among the better half of rule books among my collection. Even then, it still infringed on what is possibly my biggest peeve in rules writing: burying important or required steps in a uniform block of text. That said, I grasp how much work it can be to put a rule book together, especially if attempting to have it make the most sense to the most people.